Birthdays, when you are younger, are magical. It is the most anticipated day of the year and all the excitement that has built up in the weeks leading up to the ‘big day’ culminates in that special moment – the Birthday Party! 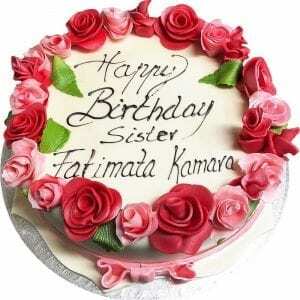 Everyone knows that the best moment is when the lights get dimmed, and the cake is revealed to chorus’ of “Happy Birthday” from family and friends. As a parent, there is no better feeling than watching your little one’s face light up in wonder as they see their special cake covered with candles to blow out and make a wish! 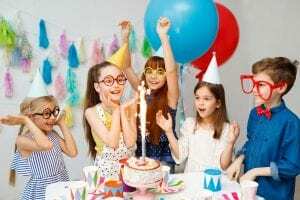 When it comes to your child’s birthday, whether they are turning the big 1, 13 or 18 (or any other special date in between) you want to make them feel special and like this is their big day. The spotlight is on them for one day only, and it’s a great feeling to be able to see your child feel like a superstar. 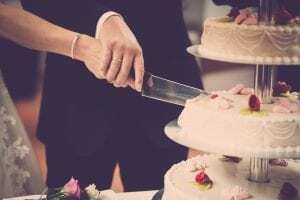 When we get older birthdays, become less magical, but if we have had fantastic parties as a child, we can still hold onto those fond memories of when we were younger. 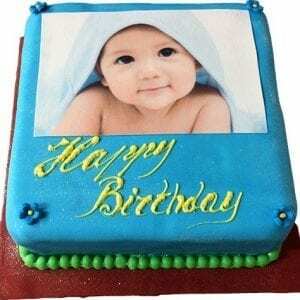 Making your child’s birthday memorable when they are young will mean they can look back and treasure those special moments forever. 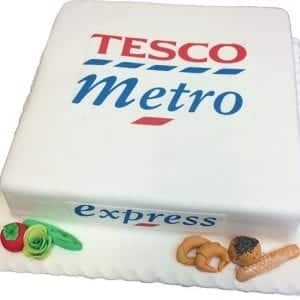 So, with that in mind, no ordinary shop bought cake will do the job. 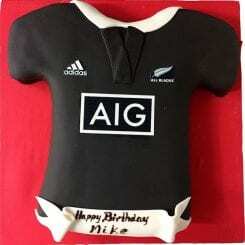 Cake not only needs to look great but taste great as well. In our years of experience, we have developed recipes that will keep the cakes rich, moist and utterly delicious (with extra licious). 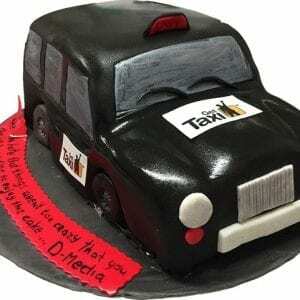 We bake cakes to order in London, and you can customise all of the cakes you see below with your favourite flavours. 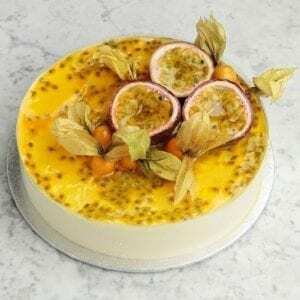 Select a cake sponge and filling type that you love! 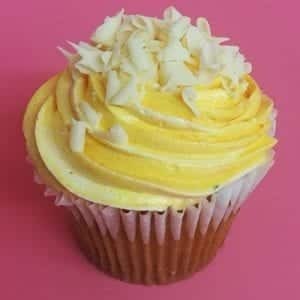 From Chocolate Sponge, Vanilla Sponge, Carrot cake, Red Velvet, Coffee Sponge to Lemon Zest and more… and with a whole host of creamy, sweet fruit jams and fillings such as Fresh Cream, Fresh Chocolate Cream, Chocolate Mousse, Vanilla Crème, Chocolate Ganache, and Vanilla Buttercream the choices are endless. 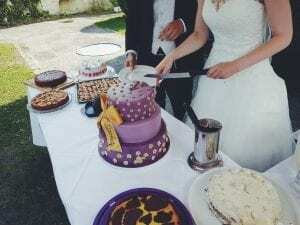 So, we’re giving you a rundown of five of our epic birthday cakes sure to put a really cheesy grin on your Birthday boy or Birthday girl’s face this year! 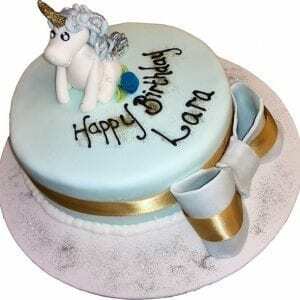 If you live in London, then we can create you a magical, bespoke Birthday cake this year! Is it a bird? Is it a plane? No, wait! It’s a cake! DC, Marvel, we love them all! 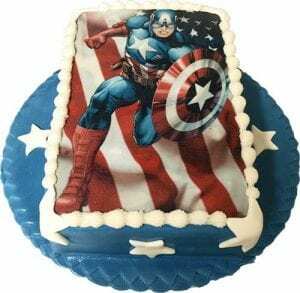 Choose your little ones’ favourite superhero to adorn their cake, or, if you’re not sure who to pick you can leave it up to us. Either way, your little superhero fan will be delighted with this super Birthday cake! 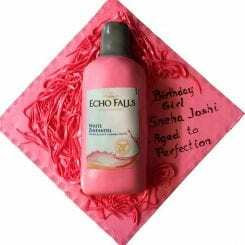 (pun intended) With the option to personalise with their name and all-time favourite cake flavours this cake will light up their eyes the moment those lights get dimmed. 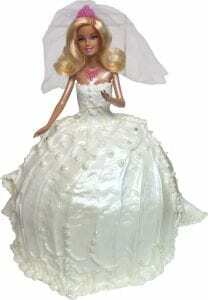 This cake is ideal for a smaller celebration and starts from only £35 for the 8” size. If you are having a larger Birthday party in London this year, we would be happy to accommodate and super-size this cake for you! “I love muddy puddles!” said Peppa – well, we’re not a huge fan of the washing pile that follows splashing about in the mud, but we could definitely get behind the idea if those muddy puddles are actually Chocolate Cake flavoured! Peppa Pig is a household favourite for every kid. As a parent, you’ll know you can’t ever entirely escape a day without her on the TV, and now here she is – in cake form! 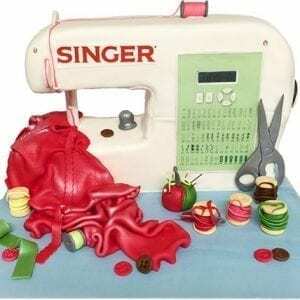 Sure to delight your little prince or princess on their birthday this year! *snort* This Peppa pig Tiered Cake is a slightly bigger option of our original Peppa cake, so it’s perfect for a bigger family gathering. 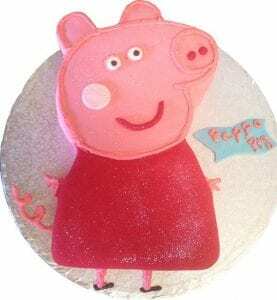 Baked with love with no nasty, artificial ingredients this Peppa cake starts from £245 and will feed up to 35 people! 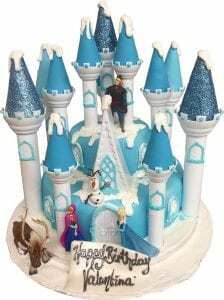 “Let it go, let it go”… and buy your birthday boy or girl this incredible castle cake! Anna, Elsa, Olaf, Sven, Kristoff and even Hans (though we’re not entirely sure who invited him)… the whole gang’s here to party with you. If you’ve got a little birthday girl or birthday boy frozen obsessed then this cake is a must! The 3D castle makes this a real show stopper and the perfect party centrepiece. 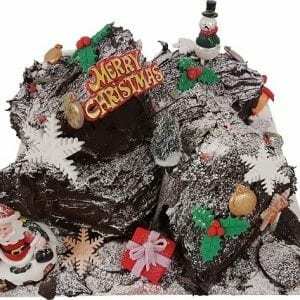 Our Frozen castle starts from only £195 and like all of our cakes can be personalised just for your special one this year. We specialise in kids birthday cakes in London, so if you have a design idea for a Frozen cake, or any other Disney inspired theme then let us know! Poppadom? Pwede Na! BANANA!! If you don’t love these little yellow guys as much as they love bananas, then we’re not sure what to tell you! Just don’t let him near the bananas! We love baking up these minion Despicable Me cakes for Birthday celebrations! 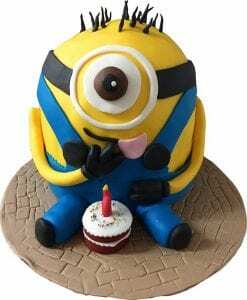 Their cheeky grin will match those of the little monkeys you’ve invited to the party, and this 3D minion cake will bring your little minion to life too and make sure this is going to be a birthday party to remember. So, if you live in London and are responsible for organising a child’s birthday party this year, get in touch! 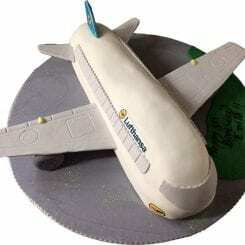 We specialise in kids birthday cakes in London and craft and create any cake you desire! We use only the best ingredients, so you won’t find any preservatives or other nasties. 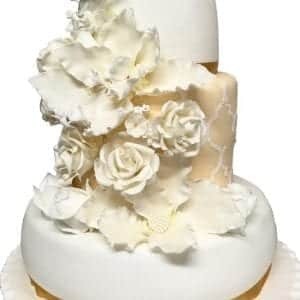 If you have a unique idea for a cake, then we want to hear about it! Get in touch today.